Prior to breaking my wrist this winter cycling season, I had the opportunity to break in a pair of the Pearl Izumi P.R.O. Softshell Lobster Gloves. Quick review: Warmest cycling handwear I’ve used. Fits large hands well. Worth considering for other cold-weather pursuits. I left for an hour-long bike commute in 5-degree weather with a light headwind. I wore only these gloves, no liners. My hands were comfortable for the length of the gently graded ride. Never too chilled. Never too warm. I rode the hour home in 20-degree temps, dropping to 15 degrees over the ride. My hands were warm enough to sweat noticeably. 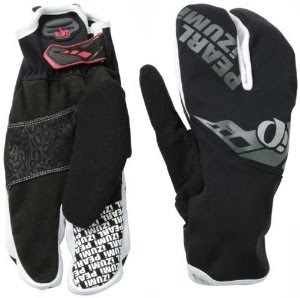 Upshot: These gloves are a great 0 to 20 degree riding option. A classic lobster-claw design, the gloves have a pair of nice features. One, the thumb is noticeably stiffened, which improves dexterity and makes shifting much easier. Two, size XL fits my large hands particularly well, a limiting factor for me in many other styles. The thick Primaloft insulation is warm, light, and compressible. The cuffs offer a secure, under-the-jacket fit and are easily adjusted. Their price ($75) must be averaged over the extent of their use. How often do you really ride in the teens and below? If you’re a regular, these gloves are highly recommended.